You are always setting expectations. When you answer an email at 10pm, you are setting an expectation. When let a call go to voicemail at 6pm, you are setting an expectation. These are difficult things to accept, especially if you're in competition for advancement or your employer is challenging your boundaries on a regular basis, but just remember that resetting expectations is much more difficult that setting them in the first place. Remembering that every action you take (or don't) defines how people will expect you to act in the future. I am currently an employee and likely will be for the foreseeable future. My career aspirations do not include management despite the fact that I love to lead teams (there is a significant difference between the two, but I'll save that for a different post). I firmly believe that you can lead a work life and a personal life that are largely disconnected and be quite successful doing so. I'm going to tell you right now: there are a lot of things wrong with this rule. The rest of that post is laden with info from other sources and a ton of exercises that I can't see many people filling out, but the idea that I should somehow lose myself in dedication to work is terribly misguided. I want to add some clarity to my thought process here. The most confused aspect of the aforementioned rule is that the terms used are not well-defined. I will do that here, defining what "work" actually means, and how it is a fundamentally different concept than your job or your career. First, let's talk about your work. Work is the list of assigned duties that you carry out, which often vary from day-to-day and may be transient in nature; you may be asked to perform a set of work for a prescribed period of time and later be assigned different work. For some people, their work will be consistent for the entirety of their employ, others it may change from month-to-month or day-to-day. But this is a good segue as there is a difference between your work and your job. Your job is the collection of work and tasks you perform in exchange for a pay cheque. Your job helps you meet your financial obligations and help to contribute to your household income. The tasks assigned are usually out of your control, though many forward-thinking organizations offer some freedom over long-term assignments and let you speak into the types of tasks you take on. Your experience in other, previous jobs will open doors for you to take on greater challenges in your next job, which may be within the same organization. Again, organizations that get this will help you form a path, leading you through more complicated work and increasingly important tasks en route to helping you move to more senior roles. Admittedly, not all career paths provide this opportunity, and that's okay, too, the important thing is finding a job that supports your career. Which leads me to the definition of career. Unlike the tasks you perform or the role you assume at a company, your career will never be fully articulated until you retire. That is, if retirement is indeed your endgame. If someone asks you what your career is today, your answer will likely be a point-in-time reflection of how you got to where you are. It is defined by the achievements you capture and the challenges you overcome. For some it will be a story of creativity and expression, for others it will be about dedication or service. I'd better drop a bonus definition in here: passion, in the context of "things you like to do". Your passion is that thing that you're likely thinking about or get easily distracted by. You've likely thought, "Someday I'd like to..." and completed that sentence with the thing that you want to be doing now. It can drive you and light you up and you are excited to talk about it with others. That is passion. Others still will explain their career as the vehicle they used to chase a passion, rather than something they were passionate about. As a concrete example example of that, I've demonstrated capabilities in software development and have been on this career path for 20 years now, writing code and leading teams. However, as much as I like writing code, my passion is actually learning, mentoring, sharing my work and teaching others. My career has allowed me to access my passion, and today I get to speak at conferences across North America and volunteer at the computer labs at local middle and high schools. Okay, so if you're not going to embrace some kind of intertwined reality, what should you be chasing? I believe the answer lies in sorting your crap out and remembering that the three things we talked about are tangible, distinct and sometimes disconnected or misaligned. Sometimes you won't like the work you're doing, but you will be completely happy with your job. Sometimes you take a job because you know you will enjoy the work for a period of time, but the job may not be helpful in advancing your career. These things are okay, at least for a time. What you need to embrace is the fact that finding the perfect combination is very difficult, especially over the long haul. As your career objectives change, the job may no longer work for you as a tool to move down your career path. Sometimes you'll have an incredible job - great employer, solid pay and awesome co-workers - but the work you're assigned isn't what you like to be doing. 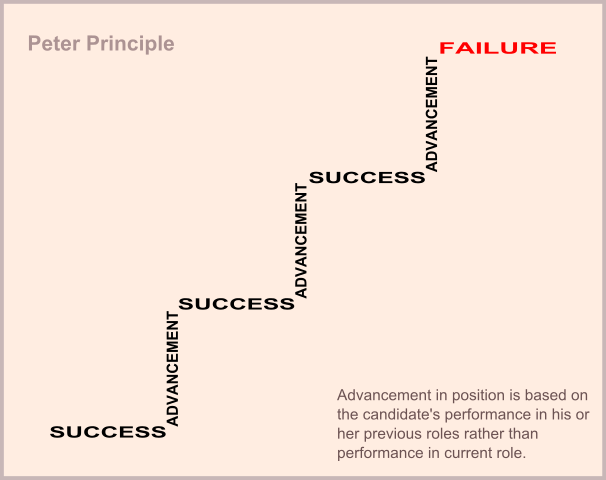 Some people – it's happened to myself – will advance through an organization based on their performance into a role that they are not suitable for and will not find be successful at (this is known as the Peter Principle). Do I have something to offer the people I work with and for? Am I working with co-workers that can help me grow? Is the work I am doing meaningful to me? Does my job give me the freedom to think for myself? Does the work I'm doing align with my ethics? Is there a way for me to advance my career or follow my passion? When I outgrow where I am, is there a place for me to go? Does my job require effort within the bounds of a reasonable workday? Am I still interested in the career story that is unfolding ahead of me? If I've got positive answers for several of these, I know I'm in a good spot. On the other hand, failing to meet my criteria here on a couple of points could be a sign that there needs to be a change of season. These questions may not be exactly what you need, but the exercise is what I believe we all need to embrace; the answers are dynamic and are going to change over time, so you need to find questions that help you identify your measure of happiness. In it's simplest terms, I believe that an employer's job begins with the assignment of meaningful, relevant tasks and ends with a paycheque. In between that space there is opportunity to challenge an employee, to contribute to their growth and provide guidance on how to develop their skills in such a way that it serves the company and helps to realize the goals of the individual, wherever possible. As employees we have to concede that an employer is concerned with generating income in greater magnitude than expense as they execute the services their clients depend on. Even when we're at a job we enjoy we will likely be tasked with actions we would not choose for ourselves. We need to be clear about our broader goals and, when appropriate, be honest when our work or our job is not checking off things from our reflection list. If an employer is mentoring you to make your work part of your life, I boldly challenge you to push back and define strong bounds through which your work cannot cross. Someone in a mentorship role who guides employees with banter of blending work and life is clearly not interested in the career of the employee, and places higher weight on the importance of completed work than on the individual. I don't want to work there. I will yield that the original post did not prescribe an explanation of "work", which is why I have above, so I'll argue this from the perspective of both "work" and "job" as I've defined in this article. The separation of work is easy; work is a task and usually requires the context of your work environment. An engineer can't complete blueprints without the requisite software, a counsellor cannot complete an evaluation without a patient and someone in janitorial cannot wax the floors without the buffing machine. And the floor. These are the types of things that can easily be slotted into your work schedule and, when you are good with time management, need not spill into your personal life on any regular frequency. The separation of job and your life is a little less trivial. To avoid carrying the stress of the day home you need to have establish some good practices around "putting your tools down", disconnecting from the office on your way out of the office. This is going to be something different for everybody, for me it involves tearing down my workspace, closing applications and checking code in. To prevent bigger picture concerns from affecting your home life such as the economy or the sustainability of the company you work at you need to regard your employment in the correct light, namely that it is part of your career, but likely doesn't define it. And when your employer puts requirements into your job that breach your personal time, you will have some hard decisions to make. Wherever you land, you need time to recharge. I agree with the sentiment from the original post that suggests multitasking can have a negative affect on you. How, then, can you intertwine work with playing with your kids? How do you answer emails when on a secluded retreat with your spouse? If getting in the zone is as easy as taking 10-15 minutes of focus, then do that during the workday. The important thing is to define the bounds of that workday and maintain them. I know some incredible folks who have taken entirely different walks of life than I. They have found success in ways that would not work for me, as I have found success in ways that may not work for you. Here are some scenarios where your workday may bleed more frequently into your personal life. The Self-Employed Running your own business is hard work. You may be working across time zones, you may have travel considerations and you need to react quickly to clients in order to collect the revenues you need to stay afloat. Family Businesses While less common these days, the daily topics of family-run businesses will naturally find their way into conversations that happen outside of the work day. Reminders, follow-ups and even stress relief may happen when you find that every supper doubles as a staff party. Those Without Family I have friends who are not into the family scene and are living a single life. They have found that the cross-over tends to happen more naturally, but have also noted that they prefer to spend their time with friends or working on their career (versus servicing requests from work). When Travel is Required Travel is a tricky beast, but one that raises the requirement to really define when work starts and stops. As an obvious impairment to split out a normal work day, work-related travel increases the relevancy of strong boundaries when you are at home. Crunch Times These are realities for most folks in most fields: as a project closes, an emergency arises or a deadline approaches, a little extra effort is going to be required. You'll need to step up to successfully complete the tasks and stay in good standing with your employer. In spite of these, I still believe that the cross-over time can be mitigated to a large degree. The important thing to do in these cases is to be more effective at communicating when the windows of work will be and ensuring that you have the support of those around you to help enforce it. Your husband or wife won't know that you are expecting a call unless you've found a way to share it with them. First of all, don't sell the farm. If you're finding that something in your career, your job or your work is unsettling, make sure you have set of reasonable questions you can ask yourself to find out why. Talk with your employer about ways to make it right and, if needed, start to explore alternate work arrangements inside your organization, or outside of it. One thing you can do, immediately, is to start blocking off time for your family and for you personally. This will help to give you time to connect with those that are important to you and reflect on what is becoming of your career. When I did this, I started to see - almost immediately - how I needed the time away from work in order to concentrate when I was there. It also paved the way for positive, sweeping changes in the time I spend with my wife and kids. It would be remiss of me to omit some of the other beliefs that I have, namely that I put my family above my job, my ethics ahead of my work and my responsibility to my family's obligations ahead of my personal interests. This means that I have had to make difficult decisions at times in order to maintain integrity and, to be honest, I suppose I'm still a long way out from knowing whether or not those were the right decisions. The best I can hope for is that hindsight reveals that the decisions were right at that time for who I was. Here is the blog post I referenced, if you're interested.